Fake Russian "Leicas" or How do you keep a good Communist on the farm when he has seen the American Dollar? 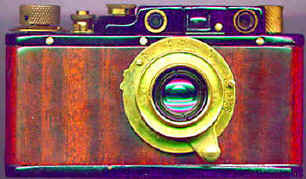 One of the MANY fake "Leica" variations. Pics sent to me by net surfer wishing to identify his "Leica." No real Leica EVER left the factory looking like this! 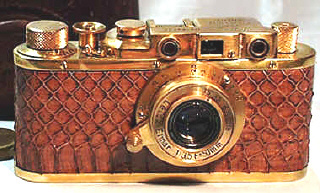 "Gold Leica" with snake skin body covering, complete with 50/3.5 "Elmar" and "Leica" Top plate. Photo courtesy and copyright of Yong Lee. 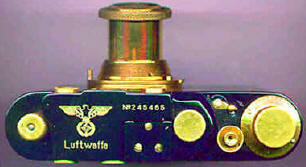 This same style can be found with the Luftwaffe engraving as shown on the upper illustration. 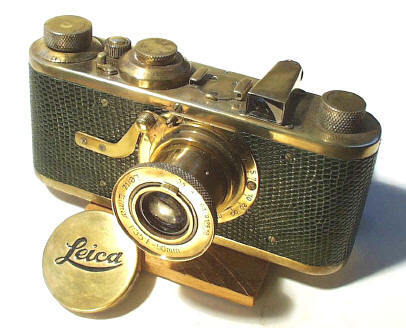 I almost forgot, it also has a "Gold" "Leica" lens cap. Startled visitors to 1995 American camera shows found new "Leicas" not listed in ANY Leica reference book. These "Leicas" were mysteriously sold out of suitcases by new "dealers" with strong Russian accents. Occasionally they admitted just getting off the plane from Moscow. The variety and innovation was startling. It reminded me of a magic wand being waved with the command "Leicas be innovative and multiply, with lots of military and Nazi engravings." It was an amazing sight to see, often 50-100 rare "Leica" cameras at a time, in different colors, finishes, and with amazing never seen before Nazi engravings. Had the wily Ruskies discovered a lost hoard of rare Leicas? War booty from Hitler's Berlin? Alas, no. But what the Russians did discover was Capitalism and the American Dollar. The great majority of these innovative "Leicas" were converted from knob wind Zorkis. The earlier Zorki was a copy of the Leica II, and apparently produced near Moscow in great numbers...hundreds of thousands in fact. So why do I keep calling these "Leicas?" Because, that is how the top plate is engraved....well at least most of them!! In Leica style no less, complete with 50/3.5 "Elmar." Some savvy, capitalism corrupted Russian was smart enough to realize that near worthless Zorkis engraved with "Leica" and various Nazism would be worth real American dollars. These instant collectible would literally fly off his shelves via Aeroflot, to the foolish Americans waiting in line to turn over the all mighty coveted American Dollar. I have no idea who turned out these little gems, if it was one technician, a team of them, or a whole group of small competing companies. But they must have done it with huge smiles on their faces, knowing they were defeating the American capitalists at his own game. Stupid Americans!! Buying Zorkis with Leica engravings....HA HA HA HA. Of course the quality was not up to Leica standards, nor were all the little details correct. These cameras could not fool any seasoned Leica collector, but could easily fool the non Leica person. But our innovative story of capitalism does not end here. Our heroes were not satisfied with merely engraving "Leica" on hapless Zorkis. No, here we see the true spirit of innovative marketing, the likes of which would make the legends of American Capitalism proud. You see, instead of merely contenting themselves to copy Leicas, the Russian heroes of this story started inventing new "Leicas," the likes of which no one had ever seen before. I like these guys. the ultra rare "Gold Luxus" with brushed brass finishes. No gold plate here folks. When these started appearing, American camera dealers across the nation started getting phone calls from the duped trying to sell their Luxus. The usually asking price was in the $5,000 to $10,000 range because they bought the camera for $200 and were foolish enough to believe it was real. Probably never in the history of American camera stores, have so few given so many laughs to so many. See pic below. Basic Chrome and Black finished "Leica" II's with 50/3.5 "Elmar"
Nazi, Luftwaffe, and Press Engravings of Hitler's personal photographer, practically in any combination on the basic models above, complete with Nazi Eagles. Fancier presentation versions of the above, with polished lacquered wood body coverings, inset Nazi Eagles with Swastikas, gold inlaid top plate engravings. These were the new "Leicas," very amazing stuff. It's really too bad Leica did not show as much innovation with their real cameras. In other words, these cameras are pretty, and FUN if you are a Leica collector....at least if you have a warped sense of humor like me. Occasionally their talents would turn to the Kiev, the copy of the Contax II. I have seen them in black, with military olive/brown finish, and with Nazi engravings. I couldn't help but imagine a group of craftsmen sitting at the local bar, getting drunk and inventing a new Leica variation, then going back to the shop the next day and producing it. After all, they were proving those stupid Americans would buy damn near anything. I keep on hoping for a magnificent Russian Leica with black enamel finish, polished wood body, gold Luftwaffe and Nazi markings, sporting an engraving of "Adolph Loves Eva." Alas, apparently there are limits even to the Russian sense of humor. After several years the newness wore off, sales slackened, and the fake "Leicas" stopped appearing at American camera shows. In 1998 the demand is starting to catch up with supply, and the few which show up for sale are selling much faster, and for more money. Leica I with Elmax lens, complete with slight wear, and supplementary rangefinder. Leica I with Elmar lens. Alas, all that glitters is not Luxus. Behold a rather well done Russian Luxus. Pic courtesy YK Wong. Who knows what "Leica" lurks in the shadows of Moscow, waiting to pounce on the American Capitalist? Three cheers for the American Dollar!! Please note this story was written from the perspective of what I have seen at American camera shows. If any of my Russian friends would like to supply more exacting details, I will be happy to correct my corrupt capitalist treatise.